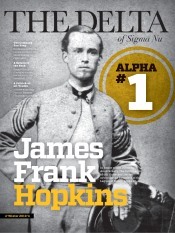 The Delta - Latest News - Talking on Twitter - Sigma Nu Fraternity, Inc.
Talking on Twitter - Is Anyone Listening? Do movements on Twitter influence discussion in real life? Can a group of people tweeting together change how people think about a problem? New research says yes. A January 2016 article on www.psypost.org highlighted new research out of Northeastern University demonstrating the impact Twitter had on shaping the national discussion surrounding policing tactics and community relations in Ferguson, Mo. As the events in Ferguson became a flashpoint for a variety of topics, Twitter users commenting on the social unrest shaped public opinion as the discussion spread to other mediums, including national newspapers and city council board meetings. How can we as Sigma Nu members use our personal and organizational social media accounts to advance the conversation on issues confronting us? 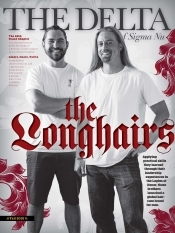 In 2010, Sigma Nu pioneered one of the first attempts to use crowdsourcing to engage constituents around the country in a hazing prevention discussion in the weeks leading up to National Hazing Prevention Week. This project came to be known as the #40Answers Campaign. Since 2011, the campaign has been conducted jointly with HazingPrevention.Org, official organizer of National Hazing Prevention Week. 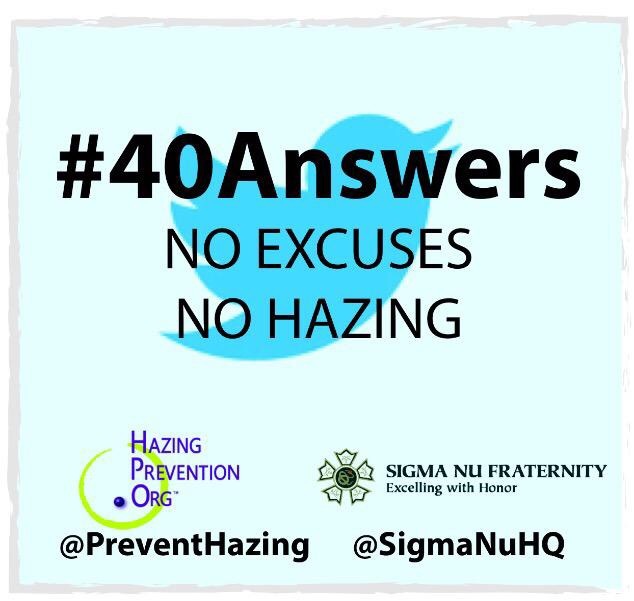 Beginning August 10, and for each of the 40 subsequent days leading up to National Hazing Prevention Week (September 19 – 23, 2016), one commonly heard excuse for hazing will be posted by Sigma Nu and HazingPrevention.Org’s Twitter accounts, @SigmaNuHQ and @PreventHazing, respectively. Participants are invited to post how they would answer if they heard that excuse. Be sure to include the #40Answers hashtag in the post so others can easily follow the conversation. Last year, the campaign appeared in over 12 million non-unique Twitter timelines. Make sure you and your chapter’s voices are a part of this year’s conversation! More information about the 2016 #40Answers Campaign is on our website.